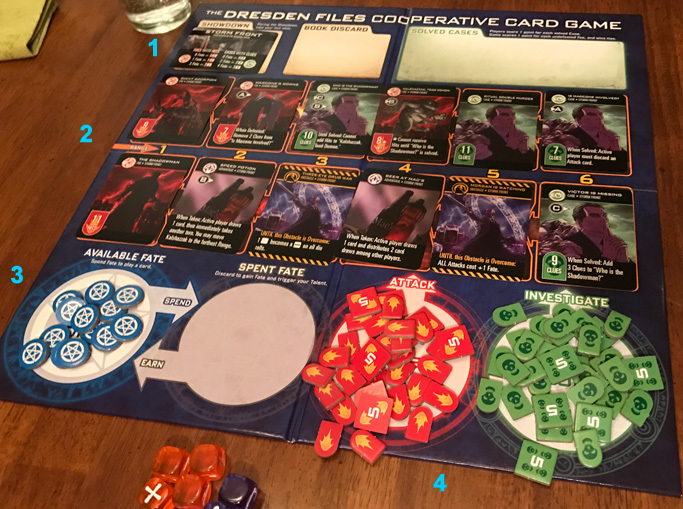 Solving Crimes and Defeating Foes With the Dresden Files Cooperative Card Game! 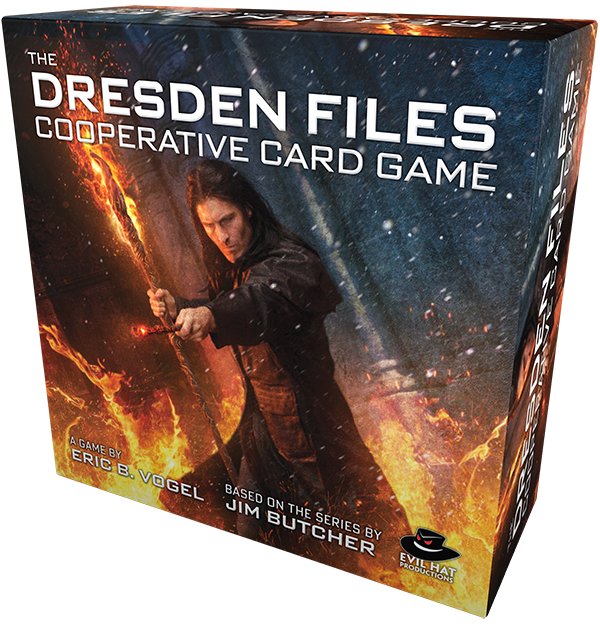 So, it makes a ton of sense for a Dresden card game to be cooperative! When Evil Hat sent me a copy of the game for review, I jumped at the chance. I’m already a big fan of the company because of the people they employ and how they share their lessons about the industry. If you don’t already know, Jim Butcher writes a series of novels about Harry Dresden, a detective with magical talent and knowledge of the occult. It’s a bit like Harry Potter, with a world of hidden magic and monsters and secrets, if this Harry was an adult with wry dark humor who drank often and left a trail of bodies wherever he went. Bottom line: a very cool world in the novels, the comics, and the RPG. 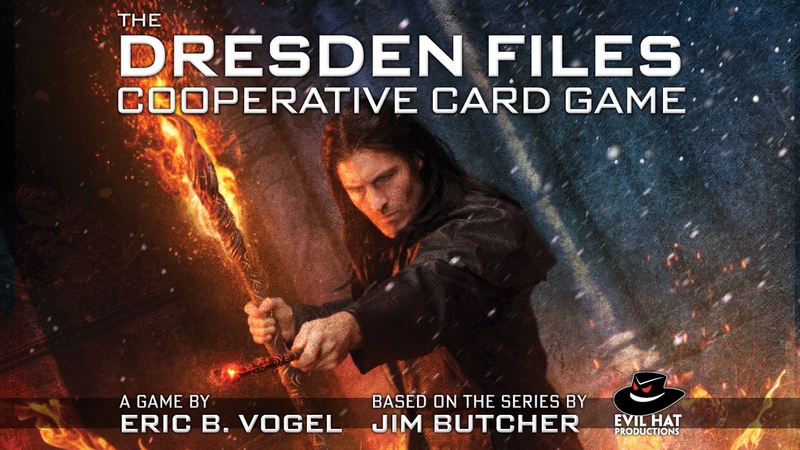 Dresden Files Cooperative Card Game is a fun game that plays in just a half an hour. Setup and cleanup are fast and easy, and the game has excellent components and a well thought out design. Gameplay can take a game to comprehend, but even by the second game the strategy emerges and becomes very interesting – more so with successive plays. The game plays well even in solo mode, with clever methods of handling 2 players and “regular” rules for 3-5 players. Play options are interesting and no deck felt obviously superior or inferior. There can be situations where a player ends up having to discard often, and doesn’t get to play sweet power cards for the good of the team. 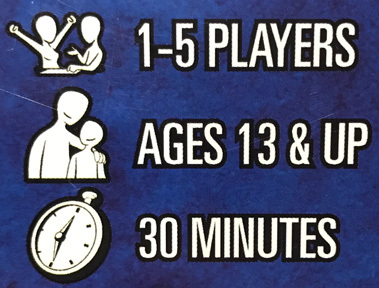 The rules talk about this, encouraging team players to ensure everyone takes turns… but in some 4-5 player games you might feel like you didn’t do as much. When you first try the game you might be expecting a deckbuilder (it isn’t at all) or to be focused on combos (it isn’t – it’s about team strategy). Even if you like deckbuilders (I love them), this game is satisfying because of the pressure of the endgame. The game has a number of interesting options, which keep the game fresh, and new expansions are low priced and can already be pre-ordered. The representation of the Dresden world is done well, even if it isn’t as engrossing and movie-reproducing as my gold standard, the Legendary: Encounters Aliens and Predator games. This is a great buy at this price. For the full details, examples of gameplay, and sweet card art, keep reading! The components are all nicely made and visually appealing. Counters are all coated cardboard, but that works fine here. Cards are all of reasonable weight. 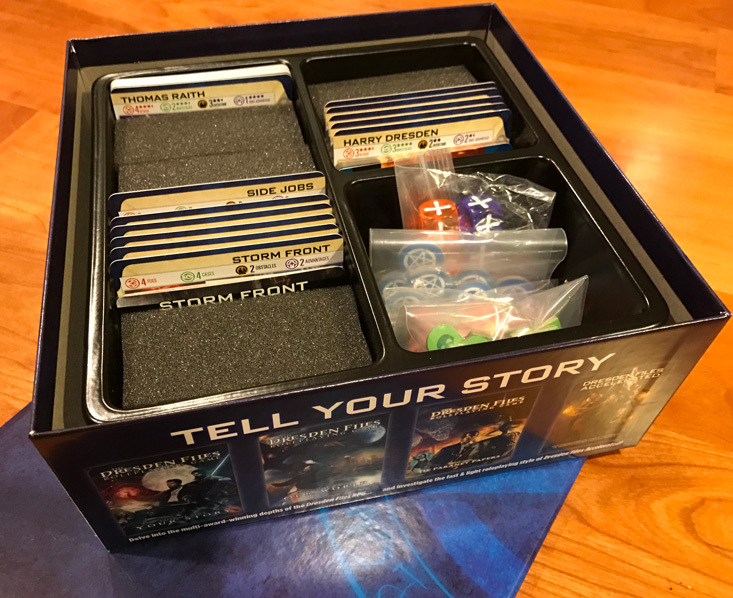 Though the box has space for expansions, it isn’t a huge box and fits easily on any gaming shelf. The box is attractive and worth displaying. The components all add something and are well designed to facilitate gameplay. For example, the game board isn’t just pretty – it provides cues to make play more obvious. The game plays very quickly once you know it, and was enjoyed by my 10 yr-old (though he is extremely good at games) and 13 yr-old. There are variants for playing with two or just one player. Setup is extremely fast and putting the game away is very easy. Awesome! The thematic concept is that Harry and his allies are solving cases and taking down terrible foes in order to solve a crime (usually representing one novel). In the game, you are trying to solve more cases than there are undefeated foes. Defeating Foes and solving Cases both help that happen. 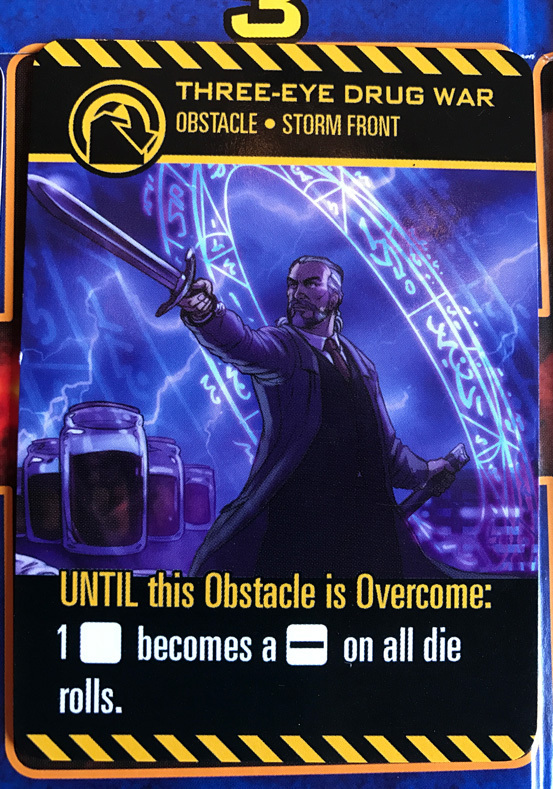 However, special cards called Obstacles, plus special wording on the foe or case cards, can make that harder, requiring teamwork and strategy. Unlike most games of this kind, you should not expect to clear all the challenges! This is a game where there are too few resources and too little time for an overwhelming victory. Instead, you are aiming for that ratio, with an eye on your dwindling resources.The first game is really a learning experience. Watching a video, such as this 12-min how-to video, can also help. The rulebook is available online. 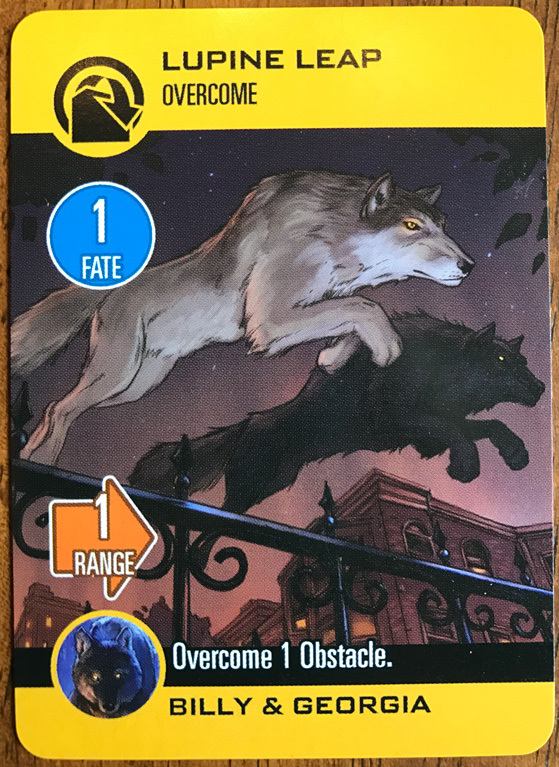 The gameplay overview: on your turn you will either discard a card to generate Fate Points for the team, or you will spend some team Fate Points to use a cool card of yours to attack occult enemies (Foes) or investigate (Cases). You don’t usually beat them the first time, but you get to add Hits/Clues, so as a team you can defeat Foes and solve Cases. Or, you might use your special power – each Character has one that works as your action, usable once per game. Because you don’t usually draw more cards, your hand strategy is important. Sometimes you might pass, which requires spending a single Fate Point. Each player takes turns until you hit a situation where you lack the Fate Points to fuel what you want to do, run out of cards and can’t pass, or decide as a group you want the Showdown. The Showdown is a last chance to beat the remaining cards. You then compare the number of Cases you solved to the number of Foes remaining, and you only win if the number of Cases is higher. In the above image, the lavender “1” is by the “Showdown” card. Each “Book” of challenge cards has one, and it provides the rules for the endgame. More on that later. The two rows with the “2” are the Book Cards. Red ones are Foes and green cards are Cases. 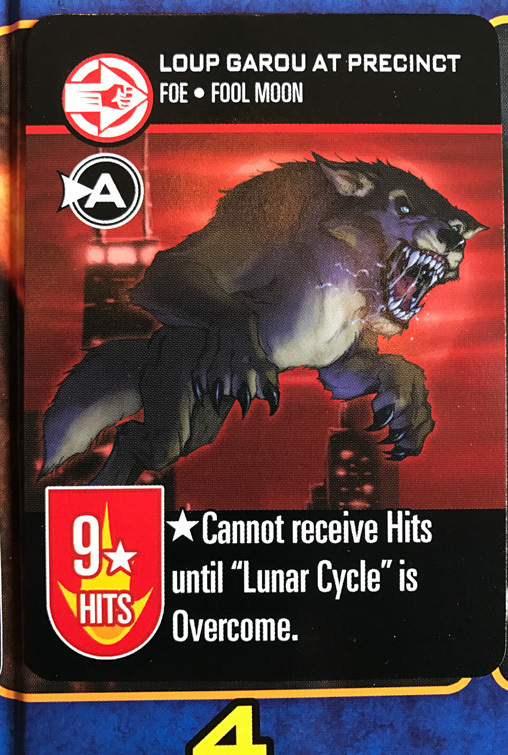 There are also a few Obstacle cards, which place special limits on gameplay until removed, and Advantage cards which provide a boon when removed. Players have cards of matching colors, which can impact the specific type of card (an Investigate card can add Clues to a Case card, while an Attack card adds Hits to a Foe). An important factor is the Range, indicated with a 1-6 between the two rows of Book cards. Most powers have a limited range, and thus the cards in the 3-6 range are very hard to target. This is a big part of the re-playability. At the start of each game you shuffle the book cards and place them all out there – the entire deck. Cards are not replaced when defeated. This makes each game different, because the starting pattern requires different strategy to resolve. The lavender 3 is by the Fate Points area. You have a pool of available Fate Points, which when used are dragged over to the Spent Fate area. Discarding cards can return Fate Points to make them available again. 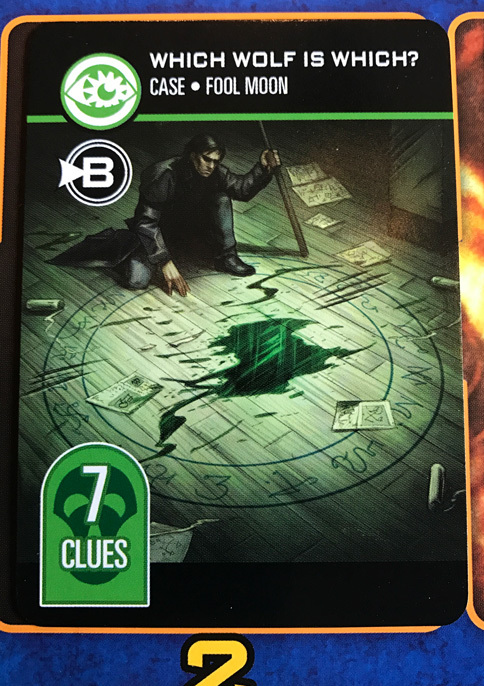 There are also areas for the Attack and Investigate Hit/Clue counters, which are moved onto Book cards when appropriate. Here is the foe, with that helpful “>A” symbol to help us see the match. The foe has 9 health, requiring 9 Hits to defeat, but can’t take hits until the above challenge is overcome. So, we want to take out that Obstacle so we can hurt the Foe. Pressure! We also see an Advantage, which provides a boon to add Clues to another card, and it allows us to draw 2 cards! 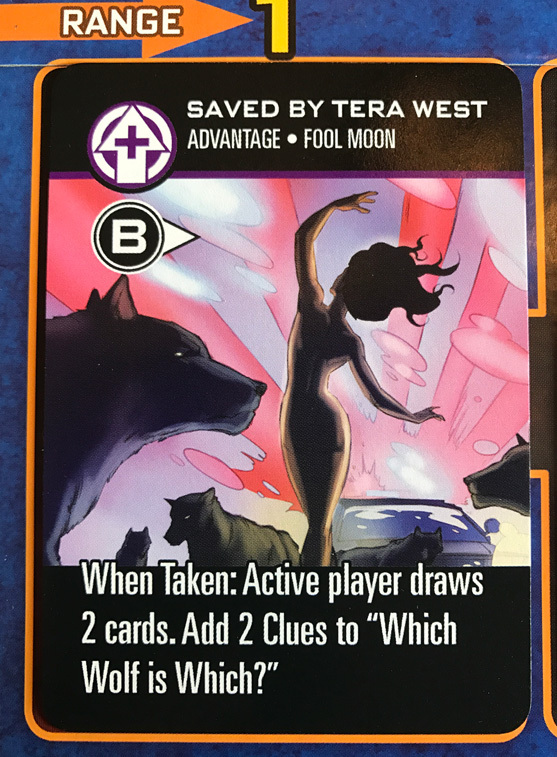 We want to take this Advantage before we defeat the related Case, but not so early that we use “draws 2 cards” without any tactical application. Decisions! Now, let’s look at the players’ side of the equation! 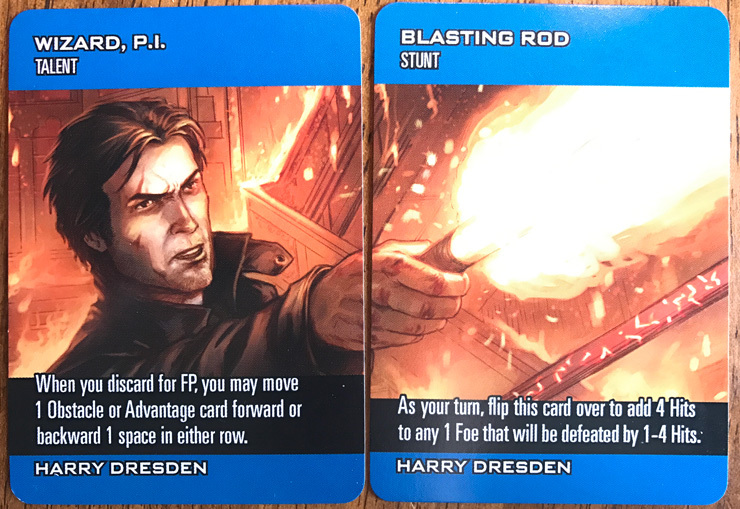 Every game features Harry (some Book cards will refer to him). He has two cards that are always out, the Talent (an always-on feature providing a benefit when you discard for Fate) and a Stunt (a use-once-per-game action). 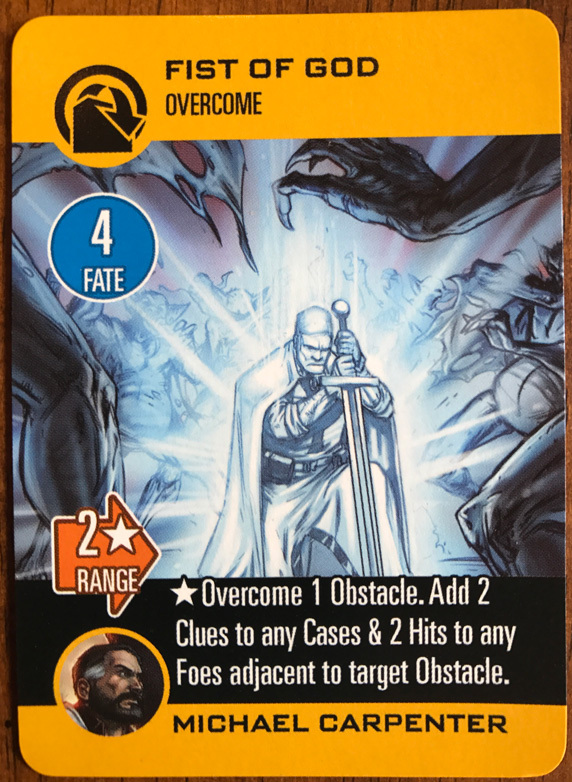 Harry can greatly help overcome Obstacles or gain Advantages by moving them around (changing their range) when discarding for Fate, and the Stunt is a great finishing power – Kill Steal! You only have one action per turn, however, so Harry has to either discard a card to generate Fate, play a card, pass, or use that Stunt. Harry isn’t alone. That Obstacle we want to take down? Billy & Georgia have this Overcome card. Let’s take a look. 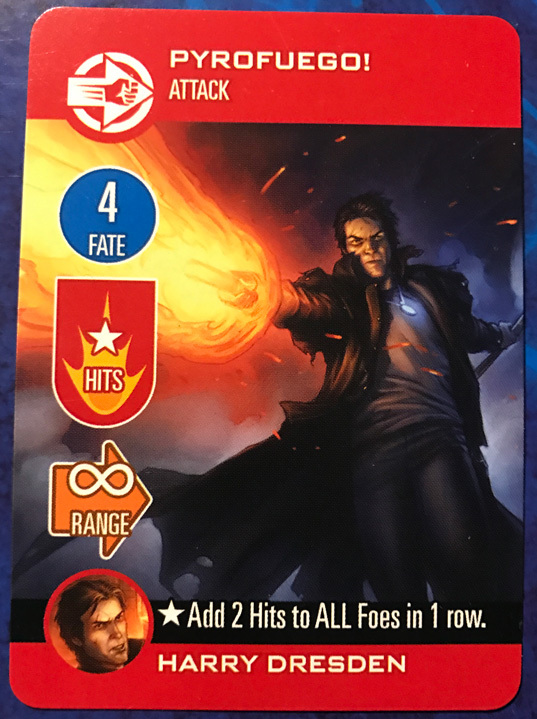 First, the blue circle with “1 Fate” means it either costs 1 Fate to play, or generates the same value if we discard it. The orange Range indicator means we can only use it on an Obstacle in the first range position. If our Obstacle is in position 1, we spend a Fate Point, discard this card, and discard the Obstacle card. We then slide the Book cards in that row closer to fill the gap where the Obstacle was. This is a great way to bring other cards into range. Sometimes we have several ways to skin the lupine. Michael Carpenter has an Overcome as well. It costs far more (4 FPs), but it has a Range of 2 and has a special bonus. We get to overcome the obstacle and add Hits/Clues to Foes/Cases adjacent to the card. Depending on the situation, this might be a better choice. Or, it might be a great card to discard and help the team by generating 4 FPs back into the pool. If you have played Hanabi, you might recall how you can use up clues to help other players, but someone has to discard to regenerate a clue token. This has that same feeling… you so want to play that card, but your teammates want to play stuff too… maybe you should discard. My first game I played Michael and ended up discarding often… it’s what the team needed. That can be a bit of a let-down. Do you let a player take a turn playing cool cards, at the expense of strategy? It’s one of the game’s few weak points (and the rules do discuss it). What about Investigating? 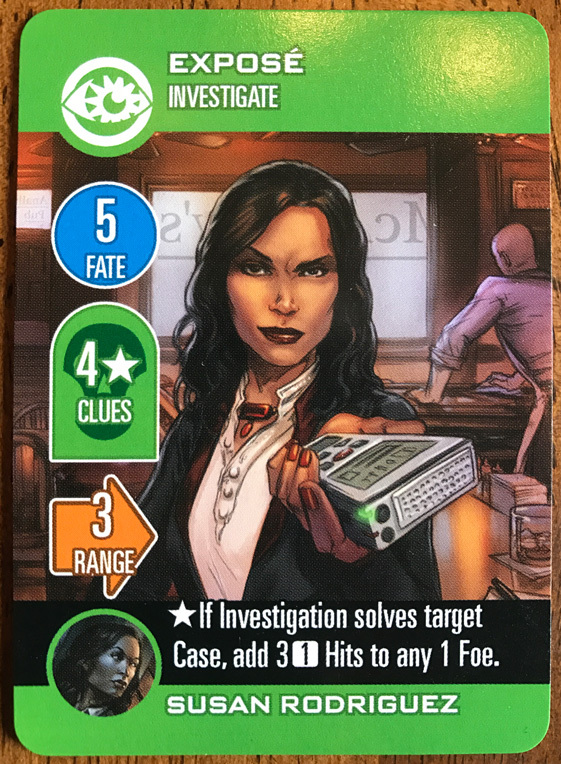 One of Susan’s cards has a high cost (5), but provides 4 Clues to a Case in ranges 1-3. And, it has a special bonus: If this card’s 4 Clues solve the Case, then we can add 3 Hits to a foe. Wait a minute… what does that mean? The number in the box “” is the number of Fate dice we roll! Fate dice have six sides, with an equal number of “-“, “+”, and blank surfaces. We might get a result of 2, 3, or 4 from this card, adding that many Hits. The unpredictability of the Fate dice is a big part of the fun! Many of the cards have this. It could appear in the cost, the range, the number of hits, or in special text. On a later turn, a player might play a Take Advantage. Karrin’s “Kevlar Vest” has variable 2 range… it could fall short of the needed range, or we might roll high and have more options. 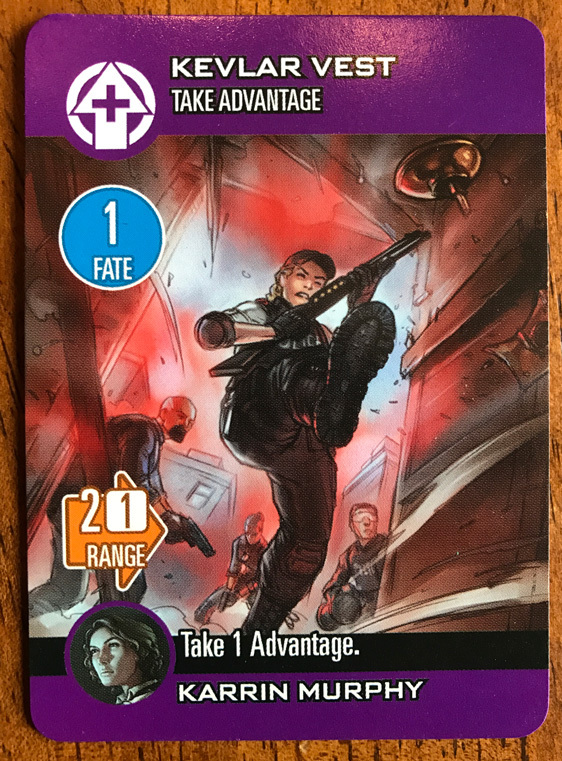 When you choose to use a card you spend the Fate, determine range, then pick the target. So, if you have one Advantage at Range 1 and the one you really want at Range 3, you could roll and either way gain a benefit. When you try to use FPs you don’t have, or if you can’t pass, or decide to end the game, you trigger the Showdown. This is one last chance to clear the cards still on the board (and there will be some)! The team rolls once only per card (dividing up the dice and rolling as a group works well), trying to gain enough Hits/Clues to overcome any remaining foes/cases. You can only do this for a Book card that has at least one Hit on it. The Showdown card lists several options for spending any leftover Fate Points. The default is to spend 0 Fate Points, usually rolling 6 Fate Dice. If you roll 6 “+” outcomes, most cards will drop… but even a net result of 1-2 + might be enough to gain an extra success. If you have leftover Fate Points, you can burn them for slightly better odds, such as spending 3 FPs for 2 (with a result from 0-7). Whether you win is a simple comparison between the number of Cases you solved and the number of Foes still in the Book row lineup. If you have more Cases solved than Foes left, you win! Yes, that does feel a bit limiting, but it helps create the tension during play once you realize the endgame. The game has a lot of strategy, and you usually realize it on your first game when it dawns on you that the game is about to end! Players start running out of cards and there aren’t enough Attack or Investigate cards to take down all those challenges. This creates a fun tension where you have to work as a team to figure out what you can take down and how best to do it. At first play, the strategy feels a bit limited and confining. However, this did not seem to be the case after multiple plays with various player sizes. The cards can play out very differently (an Obstacle at Range 1, vs the same card at Range 5 at the start of the game). And, each Book Deck has different elements that interact differently with the player cards. The game has a surprising number of options for its size/price. Discussion: The normal rules are intended to speed play, limiting how much you share about your plans. You can say “I want to play an Attack card with a high cost,” but not the exact cost or what it does. We didn’t play that way, but we also used that guidance to limit how much we spent on strategy. We still finished our games at around 30 minutes. Starting Fate Points: How many FPs start in the Available side greatly changes the difficulty. Every game I played was with full points available, and I can’t imagine having fewer. But, that means there is a lot of control if the game gets easy. Variant Start Rule: Allows you to look at the Book cards and decide one type of card you want in your starting hand. If you don’t have it, you redraw. Side Jobs: Pick one of the Side Job Showdown cards, then roll on a table to pick how many of each card type to put in the Book Deck, drawing from the 30 Side Jobs cards. You can also mix Side Jobs cards into other Book decks (or vice-versa) to change things up. 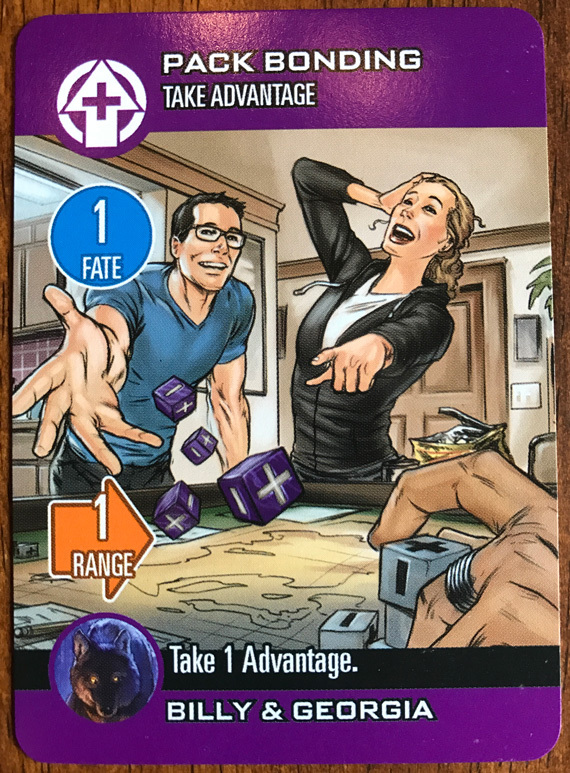 2 Player: You each grab 2 decks, display both characters’ Traits/Stunts (use one per turn max), shuffle the decks together, and draw a hand of 9. You have more cards, which compensates for fewer turns. This played awesomely! 1 Player: You play 3 decks, but have the cards out in front of you and take turns playing each one separately. I played 5-Player, 2-Player, and 1-Player games and found them all satisfying. As with any property like this, one big question is whether the world translates to the game. Yes, to a point. Nearly all of the game components capture the “Dresdenverse” essence of the novels with gorgeous art. The rule book has some fun humor, including multiple references about how Harry never catches a break (and thus a tie is a loss, etc.). 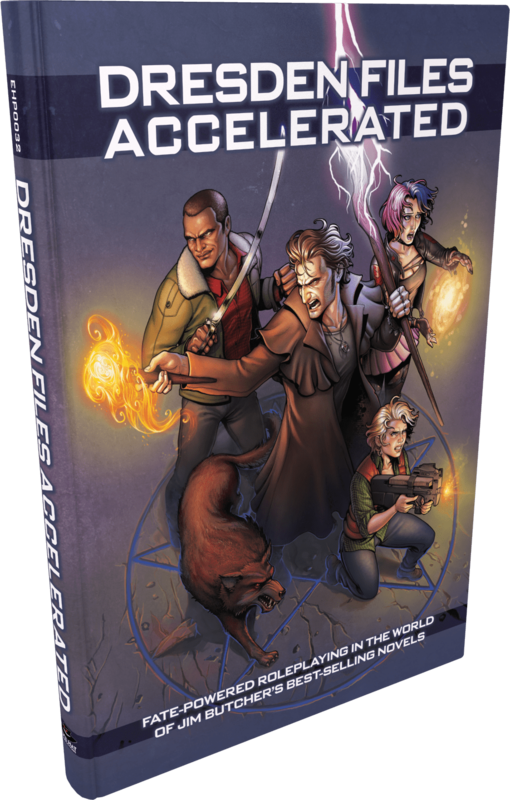 If you love the Dresden universe and want a game that lets you be in it, this certainly lets you play main stars (Harry, Murphy, Susan, Michael, and the Alpha shapeshifters) and fight foes from the novels. However, it doesn’t provide the deep experience that Legendary Encounters: Aliens and Legendary: Predator manage to provide. (To be fair, what Legendary accomplished in those games is nothing short of unbelievable.) I would have liked to see quotes on the cards, for a bit more feel, but I also appreciate the streamlined look of the cards. The game is said to be for ages 13 and up. I was pleased with how they implemented this. Yes, Advantage cards may depict beer, and Case names may include “Ritualistic Double Murder,” but, the art is never over-the-top or gross. As a parent, I felt fine having my 10 yr-old play, and we run a very low-media household with very little if any exposure to gore/etc. As with other Evil Hat games, the game showcases diversity (and half the player decks are female) and portrays everyone as capable and awesome! 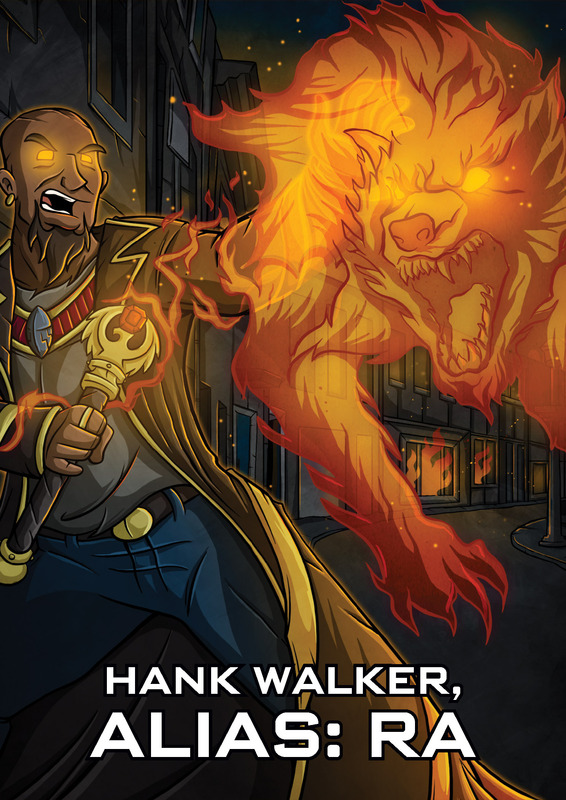 Hey, t hat Dresden Files RPG I mentioned? 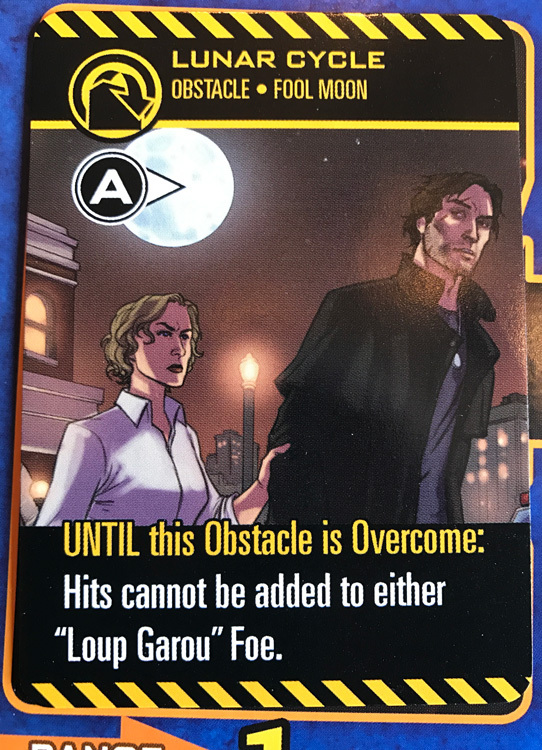 A new Dresden Files Accelerated (pared-down version of the Fate rules) can finally be preordered! I have the pdf and it is excellent. The excellent heist RPG, Dusk City Outlaws, is on its final days on Kickstarter! I played it at Winter Fantasy and I’m a backer. This is an excellent last-minute game, where you have some friends and you pull it off the shelf and go. Fast play and fast to learn. It reminds me of the scenes in Shadowrun or Spycraft or Leverage, where you get to plan how to pull off your objective (steal the plans from the vault, extract the prisoner, etc.). Unlike those games, it has clever mechanics to zoom in on the action and prevent endless planning/discussion. You quickly create a fun plan, deploy, and watch the fun begin. Rodney helped create Lords of Waterdeep and Dark Sun 4E for you… it’s the least you can do and it is a great game! Back this! I reviewed the latest set of D&D WizKids painted minis. Shoshie’sMinis reviews the new D&D WizKids line of unpainted minis! Remember that amazing Red Dragon head Trophy Plaque? 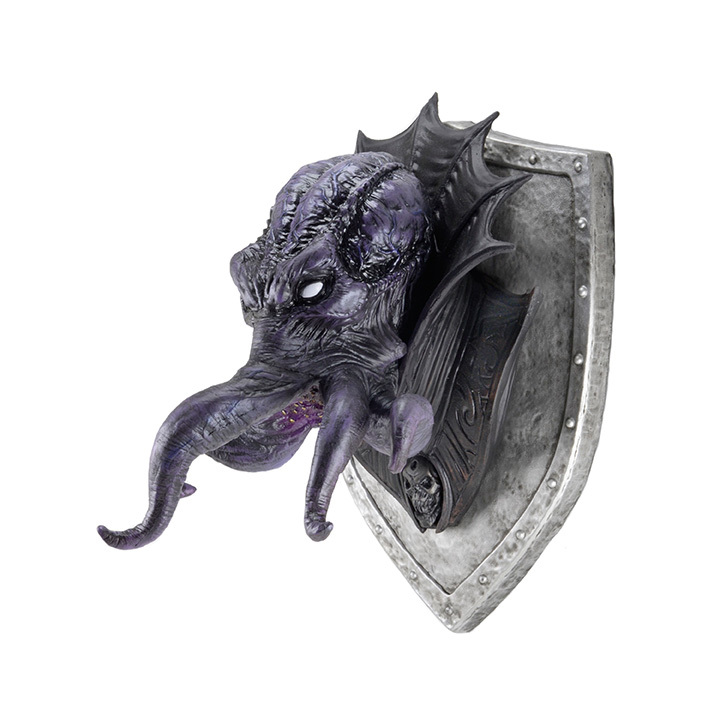 Well, WizKids now offers a Mind Flayer head! Yeah, my wife won’t let me buy that one either. If you ever want me to write an adventure in exchange for a Red Dragon head, let me know! Will write for dragon heads! This entry was posted on February 24, 2017 by Alphastream and tagged FATE.